Salt Lake City has enjoyed its share of successful female choreographers and company directors for quite some time. However, there is no denying that the essential role of the female choreographer in modern dance has slowly evolved and is possibly dwarfed by many well-known and successful male dance makers. Of course there are many contributing factors and the discussion about what can be done is a long and complex one. 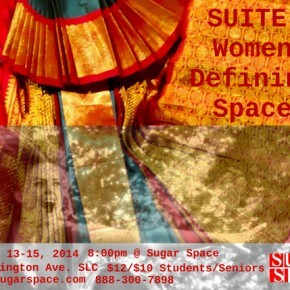 Sugar Space is playing their part in celebrating work by local female choreographers with Suite: Women Defining Space. 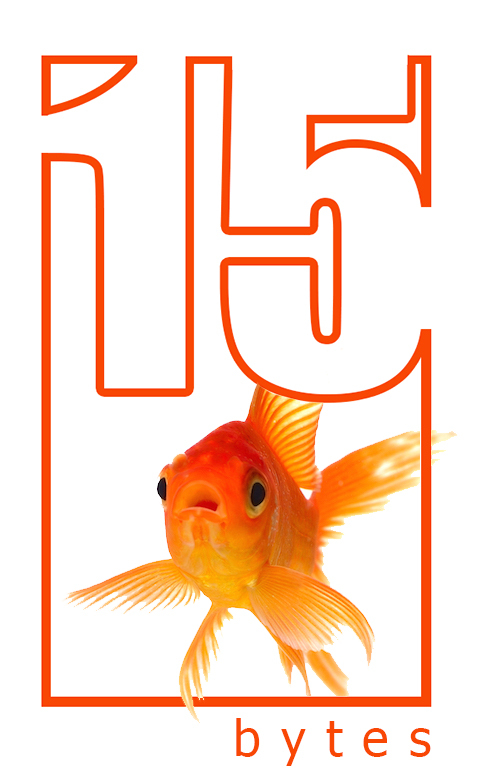 It is the fifth year of the series, and for me, it did not fail to inspire confidence in the participating local choreographers: Norianna Diesel a local dancer and Somatic Movement Facilitator, Srilatha Singh of Chitrakaavya Dance, Joni Tuttle McDonald from BYU, and Serena Webb of Body Logic Dance. Upon receiving the program for the evening, we were told to read the slip of paper with instructions for viewing the first dance. My instructions were to watch the piece while sitting on someone’s lap. Having arrived alone, I was happy to raise my hand when, as they were beginning the piece, the dancers asked for volunteers to sit on stage. Four of us were selected to watch from this perspective, which gave me a chance to see that at least one audience member did find a lap to sit on. The two dancers each performed solos to a recording of their voice. They spoke of different things, admittedly I could understand Diesel’s better, and got more out of it with her calm demeanor, strong voice, and luscious movement quality. Both dancers performed clear, direct movements that melted at times, before inviting those of us on stage to return to our seats. We were then given a little more insight to the piece called “Perception” as the dancers asked the audience, “What was it like watching this piece while noticing your breath and heartbeat, watching through the eyes of a six-year-old, sitting on your neighbor’s lap, or with one eye closed?” This revealed what the other audience members might have experienced, and gave me the sense that there was something left to ponder about the piece and Diesel’s intentions. It was a short and sweet study into individual perspective, that could have been pushed further to truly explore this idea in depth. Srilatha Singh presented two pieces of Bharatanatyam Indian classical dance. 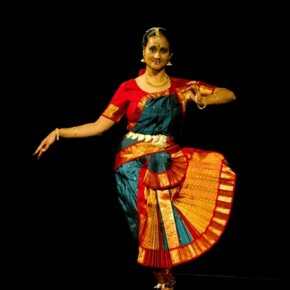 Her first dance, “Mallari,” was noted in the program as being performed for temple celebrations. It was a pleasure to see four younger dancers featured, with full ceremonial costumes and makeup. They moved around the stage as a group with complex rhythmic patterns accentuated by the bells on their ankles, and complimented by the specific hand gestures and facial expressions that were easy to pick out in the intimate space. Singh truly created something of note in her piece “Legacy,” in which she performed a solo dance to the contemporary poetry of the duo Climbing Poetree. Seetha Veeraghanta delivered the lines of the poem on stage in a clear and inspiring voice. It was a performance of mixing cultures and generations from the two women wearing beautiful Indian garments, while reading contemporary poetry from a smart phone, and interpreting through the movement of traditional Bharatanatyam dance movements, to the music of Ravel and Ravi Shankar. But somehow it all came together and worked, very well. The dance and spoken word shaped a piece that was beautiful, strong, delicate, and deliberate in the theme of celebrating life while overcoming challenges. The beautiful imagery from the text “Your children will sing unconquered through hurricanes” was interpreted into true storytelling through the captivating performance Singh delivered. “Simply Letting Be” by Joni Tuttle McDonald began with four dancers confronting the audience. The music was unsettling as an arrhythmic soundtrack, layered with the sounds of metal bowls spinning and soft piano, guided the dancers. Each dancer seemed isolated from the others until joining in partnerships dictated by manipulating each other’s body. The dancers’ beautiful lines were featured, and although the dance demonstrated the idea of finding partnership within struggle, no true relationships were formed. The piece ends sorrowfully as dancers leave the stage one by one until the final remaining dancer stops and stands with her back to the audience. I went back and forth between thinking that I wasn’t enjoying the piece to realizing that this sense of discomfort was perhaps the intent of the choreographer, succeeding in her exploration of detachment. “Anthypophora” by Serena Webb was performed by the dancers of Body Logic. Their luscious movement was interrupted by pausing to gaze, searching into the audience or at each other. The music by local band L’Anarchiste was the impetus for the choreography. I allowed myself to just see the movement and music work together on stage, without really taking away any overall theme or story. Body Logic has an upcoming performance with the band providing live accompaniment, which will create an interesting framework to see what additional meaning comes from the dance when it is performed as part of a whole evening of work, instead of an excerpt. 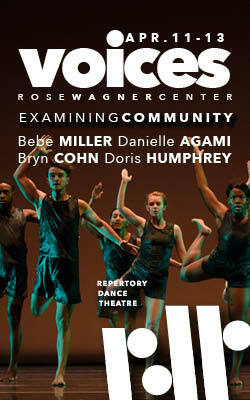 In the future of modern dance, there is room for many more great choreographers, men and women. I think the most important thing for Salt Lake City is to continue supporting its vibrant community of emerging choreographers, encouraging them to continue making dance. Sugar Space offers the opportunity to see several of these dancers again during the month of February. Body Logic Dance will present “Convergence” with live music by L’Anarchiste Feb 21-22 at 7:30. Dancers Jane Jackson and Desiree Simmons from Suite also perform in co.da which is presenting “Cause a Decision” February 27-March 1st, 7:30. More information on the choreographers below. 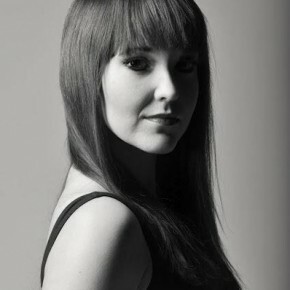 Erin Romero is a choreographer and the co-director of Movement Forum in Salt Lake City. Her work was seen in the first iteration of SUITE in Spring 2010.